Abstract. Dice snakes (Natrix tessellata, Laurenti, 1768) inhabit oligohaline and brackish waters along the Bulgarian Black Sea coast, where they often forage at sea. Under these conditions, this species should tolerate highly variable blood plasma sodium concentrations for extended time periods, but the effect of high sodium concentrations to blood cell morphology and physiology is largely unknown. 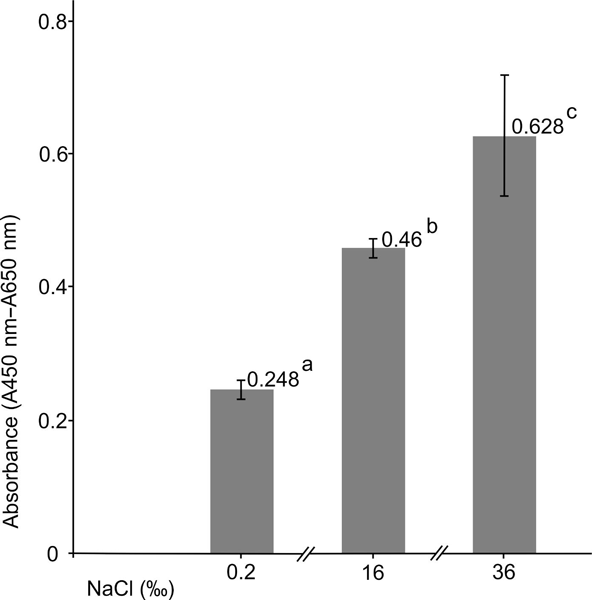 In this experiment, we placed adult dice snakes in waters with different salinity for 84h, representing the three typical saline concentrations in which dice snakes live and forage: 0.2‰ NaCl, fresh water, 16‰ NaCl, Black Sea water and 36‰ NaCl, World Ocean water. We collected blood through cardiocentesis after exposure to each treatment and used Giemsa's solution for staining the formed elements. We registered numerous nuclear abnormalities (nuclear buds, lobes and blebs) in the blood cells of all investigated specimens. In the snakes placed in the waters with high saline concentration (16 and 36‰ NaCl) we found numerous cells with ruptured membranes. These snakes also showed increased mitochondrial activity compared to those in fresh water (1.85 and 2.53 times higher, respectively). Our data suggest that even though dice snakes show a remarkable tolerance to waters with increased salinity, prolonged exposure to it induces significant physiological stress in N. tessellata, which poses a clear limit for their ability to stay in the sea for a long time. How to cite: Koleva, V., Kornilev, Y., Telenchev, I., Lukanov, S., Hristova, B., and Natchev, N.: Salt tolerance's toll: prolonged exposure to saline water inflicts damage to the blood cells of dice snakes (Natrix tessellata), Web Ecol., 17, 1-7, https://doi.org/10.5194/we-17-1-2017, 2017.